When you are searching for a Wedding Venue to host your Luxurious Miami Wedding Event, look no further than The Bath Club in Miami Beach, Florida! This location exudes historic opulence upon entering the horseshoe driveway. The valet greets you at the stunning, Spanish studded double doors, flanked by towering boxwoods. It’s like you are entering a majestic Floridian estate. The foyer is adorned with wrought iron lighting, and leads you to an amazing terrace facing surrounding Miami Beach towers. The combination of old meets new is astounding! Ceremonies, cocktails and welcome receptions can be held at the courtyard terrace – lounge furniture is included in the site rental as well. Vintage wood and glass doors open up to a fabulous interior space with sweeping cathedral ceilings, mimicking that of a Spanish Monastery. The versatility of this space is unsurpassed, as it could host an array of functions. This space then opens up to a regal ballroom, adorned with more wrought iron chandeliers dripping with sparkling lead crystal – fancy is an understatement. Original folding wood and glass doors then open up to another space, perfect for guests that want to see the party – not necessarily right where all of the action is. Satellite bars are perfectly placed here, typically flanking the grand fireplace. They really thought of everything by adding a bridal preparation room, filled with full-length mirrors and an all-white preparation table. This is adjacent to the ballroom, and perfect for introductions to be staged. They did not forget about the guys, as they also have another space that can be considered a gentlemen’s lounge. It is also vast, and could host another array of events. The piece-de-resistance is the beautiful sandy beach, accessed by a shaded boardwalk. It almost seems like mother nature has provided a gateway to this location. Ceremonies can be held right at this gateway, en lieu of having a lengthy processional. 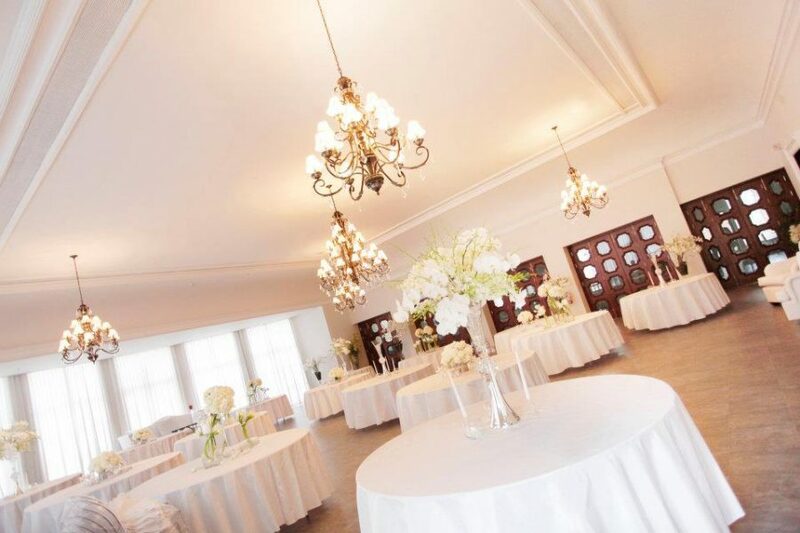 In all, A Modern Romance approves this location to host any client’s Luxurious Wedding, or Corporate Event. From a Miami Event Designer’s standpoint, this place is the perfect canvas for a publish-worthy soirée. Florida Destination Weddings are also perfect here, as they have developed strong relationships with surrounding hotels. Give us a call to discuss this location, and your wedding planning dreams!